There is an idea, frequently cited by game reviewers, that 7 is a good score, a commendable result on a scale that grants ten possible outcomes. Publishers have always seen the matter differently, though, and their disappointment at any rating below an 8 out of 10 is precisely the reason why reviewers expound the virtues of 7 so frequently. In most cases, this mismatch in perspective is little more than a detail. With games as vast and expensive as Mass Effect: Andromeda, though, a 7 is an unwelcome sight indeed, and a Metacritic average of 75 on this generation's leading console platform suggests a whole lot of those. EA may well be disappointed, but won't be alone. Given the standing of Bioware's original trilogy - a highlight of the last generation for so many people - it's not unreasonable to categorise Andromeda as not just one of this year's most eagerly awaited games, but of the PlayStation 4 / Xbox One era so far. Those hoping for (even expecting) a flood of 9s and 10s - scores to rank alongside Uncharted 4 and The Witcher 3 - will be deflated, too, but in this case they at least had some advance warning. "Whenever Sara smiles, I cringe. When she walks downstairs, I wonder if the animators know how humans move"
No sooner had the embargo lifted on the advance version of Andromeda sent out by EA than the internet was awash with gifs, screengrabs and videos highlighting a raft of visual tics and idiosyncrasies. It didn't take long for the most deplorable parts of Mass Effect's fan-base to turn their ire toward an individual, evoking memories of the bewildering rage that greeted the original ending of Mass Effect 3, eventually cowing Bioware into retroactive changes. Right now, review scores are just one of several concerns for EA, all of which have the potential to tarnish the launch of what is almost certainly its biggest game of the year. You'll be hard pushed to find a review that doesn't devote considerable space to those technical problems, at least some of which won't be eradicated by the incoming day one patch. According to PlayStation Lifestyle, which gave Andromeda 6.5 out of 10, they're enough to further undermine a game that was already falling short of greatness. "Sadly, technical mess keeps it from being good," the review states. "Several .gifs, videos, and images are circulating showing off Mass Effect Andromeda at its visual worst, and I'm sad to say that none of them are exaggerated... Whenever Sara [Ryder, the protagonist] smiles, I cringe. When she walks downstairs, I wonder if the animators know how humans move. The amount of texture pop-in makes the original Mass Effect look graphically brilliant. "The single-player suffers badly from frame-rate drops, especially during heavy combat sequences and driving the Nomad. I've been killed too many times because the lag dragged Ryder into painfully slow movement or locked her in place while everyone else shoots at leisure. Occasionally Ryder is locked in place so badly, all I can do is restart the game and lose any unsaved progress. Since you can't manually save during a mission and the auto-saving checkpoints are far and few between, just imagine how delightful this was." "Once I did actually get to play the game, rather than struggle with a fair bit of extemporaneous build-up, things improved"
Polygon is a case in point: a 7.5 out of 10 review, almost exactly in line with the Metacritic average, which opens by acknowledging that "what Andromeda succeeds at, it does very well - maybe as well as the series has ever done." However, the inventory system is described as "a total goddamned mess," the UI is "poorly equipped for the task at hand," while numerous "confusing" design decisions make important gameplay functions "cumbersome and slow." "There's a huge amount of friction early in the game that kept me from getting into things... [But] once I did actually get to play the game, rather than struggle with a fair bit of extemporaneous build-up, things improved." 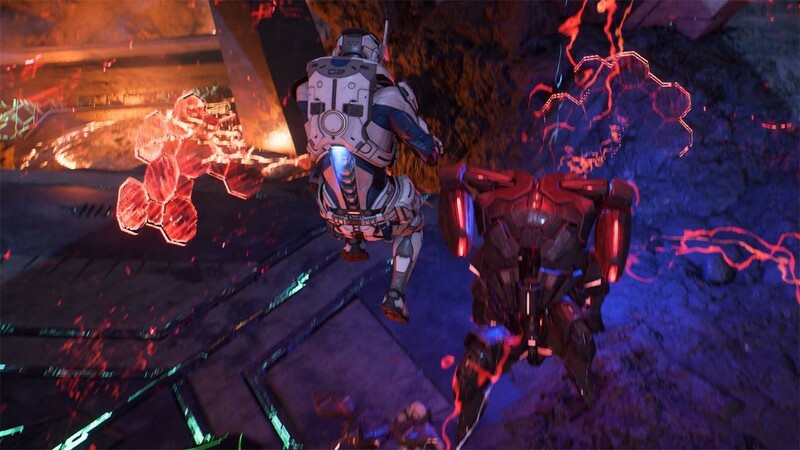 Happily, among the most obvious improvements to Andromeda are found in the "moment-to-moment mechanics," with Polygon just one of many voices highlighting both combat and freed of specialisation as more satisfying than previous Mass Effect games. "You can make the Ryder you want to, with the abilities you feel like taking. There aren't any requirements or prerequisites. My fate felt a little less predetermined, even as I focused primarily on biotic abilities to throw gravity-flipping black holes and seeking balls of telekinetic force to go along with my shotgun and assault rifle combo. These abilities mesh together in ways that yield additional rewards as you play with them and level them up, and by the end of the game, I was like a force of nature." "Andromeda's best moments all wait deeper into the game. The bad news is that you've got some legwork to do before you see them"
Polygon continues: "Ultimately, I found Andromeda's combat changes to be for the better - previous games, at best, felt functional mechanically, and the additional versatility on hand now makes for something that felt much more capable, especially as I found more powerful weapons." PC Gamer's 8 out of 10 review follows a similar structure to Polygon, opening on a list of caveats that undermine the experience for too many hours to entirely excuse. "Andromeda sets itself the task of introducing you to its new galaxy, the important parts of its old galaxy, a set of new threats, dozens of characters, and a whole new set of open-world systems, one after another. The pace of the game and the script both suffer under the burden of exposition, and there are a few writing blunders that aren't excused by even that. "The good news is that this condition is temporary: Andromeda's best moments all wait deeper into the game. The bad news is that you've got some legwork to do before you see them." At that point, though, PC Gamer found a visually "stunning" game made up of numerous, fully explorable alien worlds, all on "a scale that previous Mass Effect games couldn't match... Large interior and exterior spaces can be explored without loading screens, which means no more interminable elevator rides." This sense of freedom, created by fundamental alterations to the series' typical structure, is essential to Andromeda fashioning a unique identity, separate from the preceding trilogy. "If you could combine the story and quests of the originals with the combat, visuals and scope of Andromeda, you would have the perfect game"
"There's a lot to do on each planet, from critical path missions to the ancient alien vaults that provide the keys to colonisation. Everything you do contributes to a planet's viability score-it's a bit like the effective military strength system from Mass Effect 3, although the impact is more keenly felt... There is a lot of padding, but this open world structure fits Mass Effect more naturally than it did Dragon Age: Inquisition. It feels less like a single-player MMO and more like an expansion of the types of areas that BioWare have been creating since Knights of the Old Republic. "In the end, Andromeda still manages to be more than the sum of its parts. As a critic I can point to the things that don't quite work, the things that could be better, the things that should be better after 10 years and four of these games. I can also appreciate where improvements have been made, the basic pleasure of an improved combat system and a full-feeling, spectacular sci-fi world to explore." 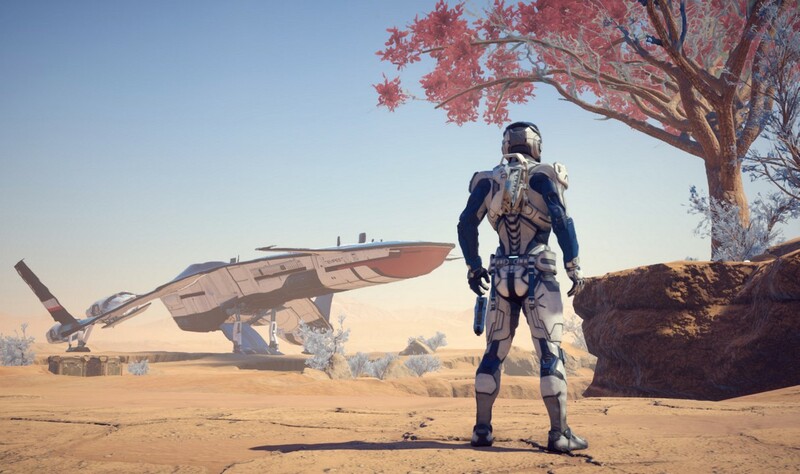 Andromeda still feels like a Mass Effect game, then, albeit a more ambitious one, with fewer unqualified pleasures than the trilogy that inspired so much passion in the first place. For Forbes, among the game's most ardent admirers with its 8.5 out of 10 review, many of its problems stem from that ambition, which results in an unwieldy game where examples of greatness are lost amidst the bloat. "Mass Effect: Andromeda is a sprawling epic," it says, "possibly too sprawling, with its size diminishing its story through an unfortunate number of unmemorable side quests. "I have a feeling that Mass Effect fans will enjoy the game, but I don't think anyone will claim it outclasses the original trilogy, outside of maybe the very first game. If you could combine the story and memorable quests of the originals with the combat, visuals and scope of Andromeda, you would have the perfect video game, though I think what's offered here will satisfy most." For everyone else, it may be necessary to remind themselves of the first Mass Effect, another uneven mix of the shoddy and sublime. That required a sequel to find a more rewarding calibration of its many ideas and mechanics, and the same may be true here. What sets Andromeda apart, perhaps, are the expectations it was required to satisfy, and the temperament of the world that received it, ten years on. Having played Mass Effect Andromeda for the full 10 hours on EA access prior to receiving a review copy and putting a further 10hrs into the game I'm guessing these facial animation issues, characters walking down stairs issue and other issues are platform specific as I've not seen any of them. Andromeda is a good game, despite what the large commercial sites say. And let’s be honest, does anyone take note of what the commercial sites have to say nowadays!! Indie sites have and always will be more trustworthy & honest, if you take note of reviews that is..
@Pete Thompson: So is GI a commercial or an indie site? ;) Usually commercial ones inflate scores as they are paid to but in this instance it seems the other way around... Tbh GI has had some questionable articles and editorial comments lately that make me question the overall objectivity of the site. As a former educator, I can tell you that anyone who came up through the public school system sees a score of 7/10 or 70% as being a C or a C- depending on how strict the school was. In my schools that was 1 point above a D and that's NOT acceptable or good. It's barely average. @Jordan Lund: This is not school we are talking about; In school a number is going to be a conditionant in your near future and in what are your choices after you finish your studies. We are talking about a videogame here; where a number in a website; one that some reviewer gave to a game based in his personal opinion and that has 0 consequences on the reader's life. That comparison is taking it a bit too far away, imho. Which is exactly the problem of a lot of people our there; Sure in the industry we use the score of metacritic as a useful and orientative measure. But when the final customer's only criteria is a number in a website, then we have a serious problem. Besides, and as a former educator too: A 7 in physic education or Computer science is not the same as a 7 in Chemistry or Math. All must be kept in it's own context. Well I'm only seven or eight hours into the game, I have also not seen any of the facial animation issues. I do however know that they're mostly caused by customization. Anyone who knows me knows I'm against modding or the changing of creator intent in any form, and i'd much rather see a well-developed character model, then one hung on an animation frame that has attempt to fit a million different faces.